We’ve all been there…you get an invite to a potluck, party or shower at the last minute and you have no idea what to make. You want to make something that is more exciting than a veggie tray from the supermarket but takes less time than baking. This Easy Skor Bar and Caramel Apple Dip is the answer. It is easy, delicious, no-bake, ooey, gooy and it will leave people saying “OMG, I can’t eat enough of this. I NEED the recipe.” Trust me, it is that good. Plus you will look like a hero without ever turning on the oven. Winning! 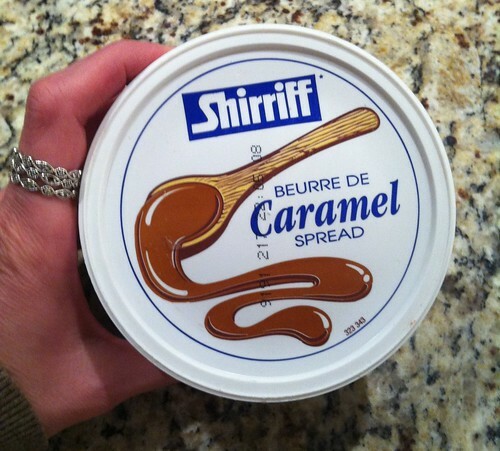 Skor bar, caramel and cream cheese come together to make an amazing dip for apples. Spread cream cheese onto a serving plate. Sprinkle with Skor bar pieces. Serve with Granny Smith apple pieces. Delicious thick and rich caramel sauce. Oh my gosh, I would die and go to heaven. Love caramel! Hey, that will really be a treat for people like us who have sweet tooth. Thanks for the recipe! Hey Merry, I was going to ask you for this. BTW – where’d you find the “whipped” cream cheese? Hmmm..okay maybe it’s not called “whipped”. It’s the spreadable kind in the tubs not the bricks. You could really use either one but the tub one is easier to spread out. Oh my…….the kids go crazy when I bring this little treat out. I was the coolest soccer mom last year when I brought it for the snack. so, so good. Be still my heart. That looks AMAZING. I have not made these…but I certainly WILL be. They look delicious!Looks yummy!